There are 27 Assisted Living Facilities in the Broadview Heights area, with 2 in Broadview Heights and 25 nearby. The average cost of assisted living in Broadview Heights is $3,300 per month. This is lower than the national median of $3,346. Cheaper nearby regions include North Royalton with an average starting cost of $3,300. To help you with your search, browse the 106 reviews below for assisted living facilities in Broadview Heights. On average, consumers rate assisted living in Broadview Heights 3.0 out of 5 stars. Better rated regions include North Royalton with an average rating of 4.3 out of 5 stars. Caring.com has helped thousands of families find high-quality senior care. To speak with one of our Family Advisors about assisted living options and costs in Broadview Heights, call (855) 863-8283. Broadview Heights, Ohio is a suburb of the greater Cleveland area. The city was established in 1811 and, with some descendants of the original pioneers still calling the region home. Thirty-one percent of the 19,229 residents fall into the 55+ demographic. While there are only two assisted living facilities (ALFs) right in Broadview Heights, there are an additional 37 in nearby communities. Each ALF is under the jurisdiction of the Ohio Department of Health. Broadview Heights is on par with the national average when it comes to rainfall. But snowfall is greater by more than double, and there are only 165 sunny days annually versus a national average of 205 sunny days. Taken with a temperature range of 20 to 83 degrees Fahrenheit, this yields a comfort level that matches the nation's average score of 54 out of 100. Seniors might find winter hard, but the climate overall is manageable. Seniors can spend a relatively worry-free retirement in Broadview Heights, as crime rates are much lower than the U.S. average. Violent crime rates stand at just 19.7 versus 31.1, while property crime rates stand at 12.3 compared to 38.1. Seniors might breathe easier in Broadview Heights. The city scores 11 percent better than the national average when it comes to air quality, according to the National Air Toxics Assessment. The risk of developing a respiratory disease is lower in Broadview Heights when compared to the Cleveland-Elyria metro area, the state and the country. While the cost of living in Broadview Heights won’t empty seniors’ pocketbooks, it’s still 6.9 percent higher than the national average. Seniors should note that next to housing, health care costs are the next biggest financial concern as it's 8 percent higher than the national average. The city does offer a prescription drug discount program that might help defray some medical costs. Broadview Heights has an array of community resources for seniors, including the Broadview Heights Human Services Department, an organization that provides busing, nutrition, library, recreation and other support, as well as one recreation and senior center. Broadview Heights is home to world-class medical facilities, including University Hospital's Broadview Heights Health Center, in the event of medical emergencies or illness. Assisted Living costs in Broadview Heights start around $3,300 per month on average, while the nationwide average cost of assisted living is $4,000 per month, according to the latest figures from Genworth’s Cost of Care Survey. It’s important to note that assisted living rates in Broadview Heights and the surrounding suburbs can vary widely based on factors such as location, the level of care needed, apartment size and the types of amenities offered at each community. 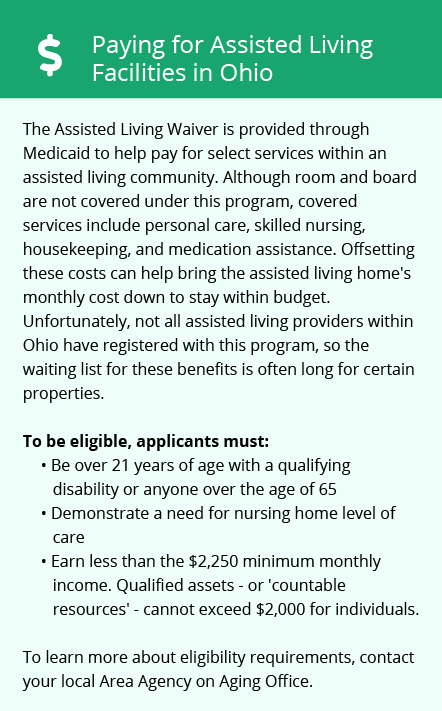 Ohio has two means of financial help for seniors who require ALF care. 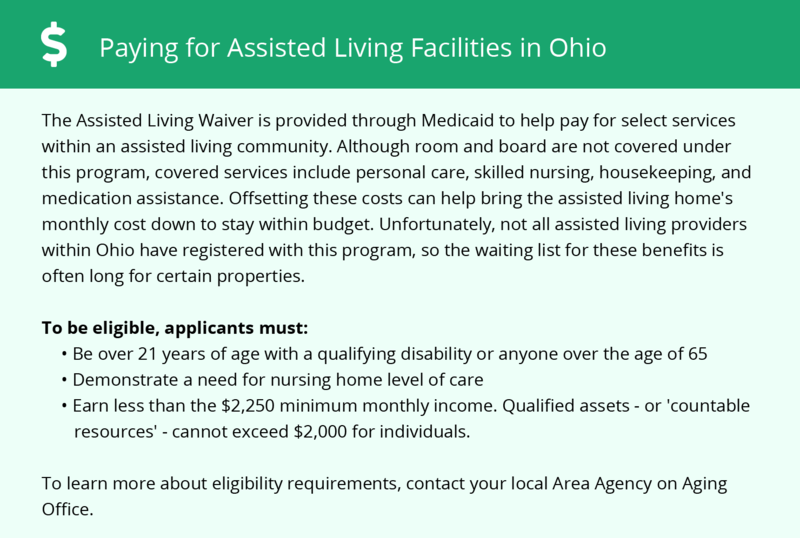 These include the Ohio Residential State Supplement/MyCareOhio (ALFs must be individually approved in some counties) and the Ohio Residential State Supplement. To see a list of free assisted living resources in Broadview Heights, please visit our Assisted Living in Ohio page. Broadview Heights-area assisted living communities must adhere to the comprehensive set of state laws and regulations that all assisted living communities in Ohio are required to follow. Visit our Assisted Living in Ohio page for more information about these laws.